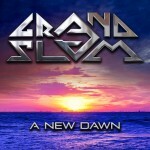 Share the post "Album review: GRAND SLAM – A New Dawn"
Next up – guess what….a melodic, AOR release out of Sweden ! If I didn’t get a free promo copy from the record label, this would undoubtedly be on my annual wish-list to the North Pole. Stonkin’, beltin’ Nordic noise from Grand Slam on February 2016’s release “A New Dawn”. Hell, I might even buy it anyway just to make sure these guys are 15 euros better off. Catchier than a cold and with more hooks than a mafia-owned meat-locker, this album stands head and shoulders above the rest in the absolute tsunami of Swedish rock releases around at the moment. Sporting a couple of mid-‘80s Vince Neil-type hair/headband get-ups (and neither of them on the two chick back-up singers ! ), Grand Slam kick-off with a serious pace-setter in album opener “Light Up The Sky”. The whole album is like a New Year’s Eve hooley where stripey-panted Scorpions of yore get up and jam with leather-clad, Tempest-led Europeans (see what I did there ? ), all to great effect. Wonderfully-named lead singer, Andy Sinner, (the only Swede who is not a ‘Berg or a ‘sson?) is to lead vocals what the Titanic was to epic movies – lungs like leather airbags and he leads these cracking tunes, front and central. “Don’t Leave” recalls The Zoo in its chunky riffage and thudding verse whilst “Get High” is nothing but damn good romp and roll. A New Dawn rips and never dips although a minor criticism might be that it’s a bit one-paced (fast and furious) but I’m just being picky because we don’t give 5 out of 5s very often at GRTR! Each song seeks to outdo the last in terms of sheer tonnage – not a single smoochy ballad in sight but you will get laid if you play this to your favorite rockchick. Grand Slam has had numerous line-up changes since forming in 2007 and I’m hoping they can keep this one together because this album rocks like a mofo. This entry was posted in ALBUM REVIEWS, ALBUM REVIEWS (Mobile), All Posts and tagged A New Dawn, album, AOR, AOR Heaven, Grand Slam, melodic, review. Bookmark the permalink.